Prime Minister Benjamin Netanyahu answered recent criticism regarding the absence of Sephardic Jewish figures on Israel's new money bill and promised that "next time we'll bring a Sephardic representative." The new NIS bills will feature poets Shaul Tchernichovsky, Rachel, Leah Goldberg and Natan Alterman, all of them Ashkenazi. Deri: Why no Mizrahim on new NIS bills? Netanyahu added that his personal choice to adorn Israel's next series of banknotes will be Rabbi Yehuda Halevy, who he deemed "one of Israel's greatest poets, whose poetry I think is genius." The affair demonstrated once again that the sectorial rift between Ashkenazi and Sephardic Jews is still a relevant issue in Israeli politics. "It is unconscionable that not one Mizrahi poet could be found for embedding his portrait on the banknotes," Shas' Aryeh Deri said on Friday. "Money adorned with an image of a Mizrahi figure is not worth less." As the clamor rose, Economy and Trade Minister Naftali Bennett urged "sensitive" treatment of the matter, and emphasized on his Facebook page that "there's no reason to miss opportunities that could bridge that gap between different sectors." Since printed money bills were first issued in Israel, they featured only one distinct Mizrahi figure – Moses Maimonides (Rambam), with some including the Sephardic-Italian Moshe Montefiore. Israel's first NIS bills in 1959 presented images with no sectorial marks: A woman farmer, sailor, worker, scientist and settlement pioneers. But on the 1969 series Albert Einstein, Hayim Nahman Bialik, Chaim Weizmann and Theodor Herzl – all Ashkenazi – were so honored. 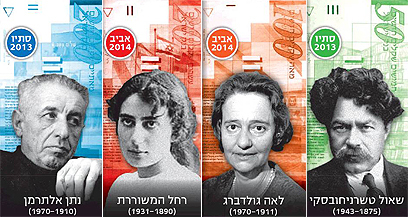 Moses Maimonides, the first Mizrahi on an Israeli bill, has been featured only since 1980. See all talkbacks "Netanyahu: Sephardic Jew on next series of banknotes"